CITY HALL — The mothers of two young children killed last year when a runaway delivery van struck them on a Chinatown sidewalk attended an emotional press conference Wednesday to endorse a new law that toughen penalties against unsafe drivers. The "Hayley Ng and Diego Martinez Law" is named for the two pre-schoolers who were run down on East Broadway near Chatham Square last January by a delivery van that was left in reverse and backed up onto the curb. 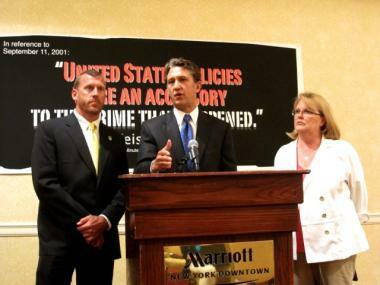 The proposed legislation awaits Governor David Paterson’s signature after passing both the state Senate and Assembly last month. The bill would allow for charges to be imposed on a driver involved in an accident where a pedestrian, cyclist or other road user suffers injury or death as a result of unsafe driving. Councilwoman Margaret Chin speaks at the press conference, with May Ng and Wana Wu standing behind her. Current state law does not mandate any punishment for drivers who unintentionally harm pedestrians, but nonetheless act carelessly with their vehicles. The new legislation categorizes negligence as a crime punishable by up to a $750 fine or jail time for the first offense and a misdemeanor charge for the second offense, as well as the possibility of suspension or revocation of a driver’s license. No charges were filed against the driver in the incident involving Hayley, 4, and Diego, 3, who were walking hand-in-hand with fellow classmates after a trip to a nearby library when the truck hit them. “Nothing we do here today will bring Hayley and Diego back,” said State Sen. Daniel Squadron, who introduced the bill in the Senate, on the steps of City Hall Wednesday. Implementation of the law would “make a strong statement that pedestrians are an important part of our city,” said Councilwoman Maragaret Chin, who represents Chinatown, at the press conference. Because prosecutors require evidence of intent to pursue vehicular manslaughter or homicide charges, drivers rarely face any repercussions for negligent driving, said Transportation Alternative Executive Director Paul Steely White. The bill was introduced in the Assembly by East Side Assemblyman Brian Kavanagh, and has also received support from Assembly Speaker Sheldon Silver and Manhattan Borough President Scott Stringer, who also spoke at the press conference. “When you get into a car, the life of the surrounding community is in your hands,” Stringer said. Squadron added later that he didn’t see any roadblocks for the bill other than the recent gridlock in Albany. 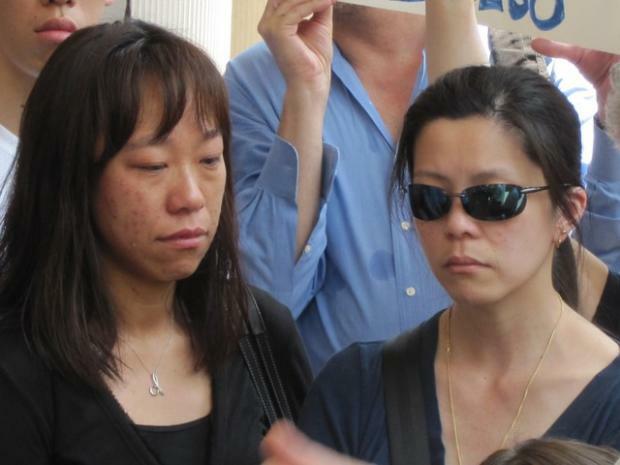 After the event, the two young victims’ mothers, May Ng and Wana Wu, wept openly as the crowd consoled them.